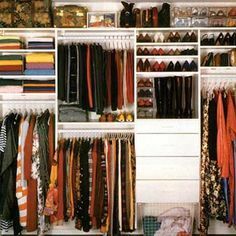 Do you get anxiety when you step or look inside your closet? Is it such a disaster that you find yourself wearing the same things over and over because they are easiest to access? If your closet were a boutique or department store, would you enjoy shopping there? No matter how big or small your closet is, it’s extremely rewarding when it’s organized. Pick a rainy afternoon – we’ve been having a few of those lately – and dig in. First, review our purging tips in this blog then get started. Soon you’ll enjoy “shopping” in your closet again. Purchase and use matching hangers. We love the non-slip kind that won’t put hanger marks in the shoulders of your shirts. They can be found at The Container Store, TJ Maxx Homegoods, Amazon, etc. Hang everything in the same direction so you can view your wardrobe easily. It will feel like shopping in a department store. This is especially important if you have a smaller closet. 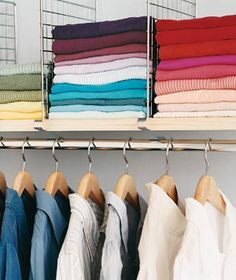 Organize by pants, sweaters, T-shirts, Jackets, tanks, skirts, etc. Pack up your winter wear to free up space and do the same this fall. Invest in storage bins that will protect your clothing while they are stowed away. One of our employees even hangs her children’s clothes this way. It makes it much easier to put an outfit together. Go a step further and hang tops/shirts with the shortest sleeve first and work out into long sleeves. In an unorganized closet, many items go unnoticed and unworn. During this reorganization, move all of the clothes you don’t wear to the front. It may motivate you to wear them more. If not, donate them at the end of the season. In conjunction with the above, if you have a “go-to” outfit or style that you are favoring right now, keep those items up front too. Tried and true classics that never go out of style and represent your style can be highlighted here. Be honest and donate or consign items you haven’t worn since last spring and summer. Unless it’s an item you may wear on a special occasion, it’s time to get rid of it so you can free up space in your closet. This will give your favorite items more room to spread out and be seen. Our blog post “How to Organize Your Closet” goes into a bit more detail but the above should help get you started in the right direction. Also, check out our Pinterest Board: An Organized Closet. We can’t get enough of these tips! Do you have any closet organization tips to share? Let us know in the comments!